Da Capo Lifelong Books, 9780738218953, 272pp. Why do sports captivate people? They allow us to watch human beings achieve peak performance, but, beyond physical strength and skill, what's really impressive is an athlete's mental prowesstheir will to succeed, engagement with their environment, and self-confidence. 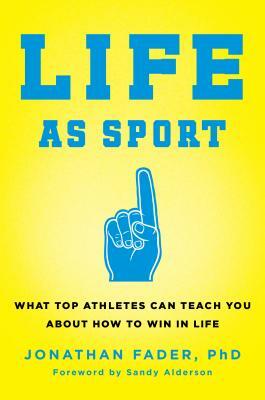 In Life as Sport, sport psychologist Dr. Jonathan Fader shares the skills that he teaches professional athletesto enhance motivation, set productive goals, sharpen routines, manage stress, and clarify thought processesand applies them to real-world situations. Dr. Fader's book is the product of thousands of hours of conversations with athletes from various teams and sports: power forwards, tennis phenoms, power-hitting outfielders, and battle-scarred linebackers, as well as hedge-fund managers, entrepreneurs, A-list actors, and dozens of other elite achievers in sports, business, and performing arts. It offers a compendium of stories, theories, and techniques that have been helpful to players, coaches, and executives in professional sports. What emerges is more than just a set of techniques, but a life philosophy that anyone can live by: an internal code to help translate our talent and drive toward the highest plateaus of performance. Dr. Fader designs his strategies to be studied, learned, practiced, and improved. He offers his readers the same exercises that he uses in every session with a professional athlete. These exercises help you to get truly engaged, whether you are designing a new business plan, working to inspire a team or individual, or even falling in love. This is what it means to truly live life as sportto approach it with the same immediacy, wonder, and engagement that athletes feel at their peak during a game. Life as Sport helps you to pursue your own goals with an enriched intensitynot only because it creates new potential, but also because it helps you unlock what was always there to begin with. Dr. Jonathan Fader is a licensed clinical psychologist and sport psychologist based in New York City. Dr. Fader is the team psychologist for the New York Mets baseball team. He is also an assistant professor of family medicine at the Albert Einstein College of Medicine. In his role as the team psychologist for the NY Mets baseball team, Dr. Fader works comprehensively with professional athletes in the major leagues on maintaining motivation, developing optimal mental routines, and increasing peak performance.